The Colony 2174 - Mine Resources, Survive the Planet, Build your Colony! Mine Resources, Survive the Planet, Build your Colony! 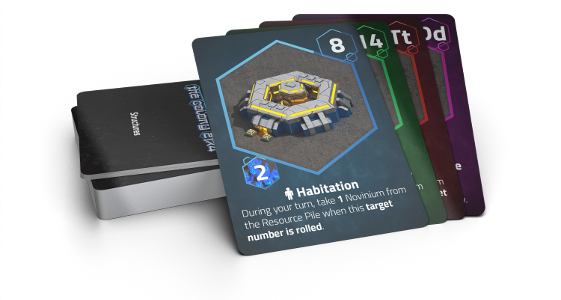 The Colony 2174 is a deck building and dice rolling game where you have to settle a new planet by building your four Colony structures using the rare resource Novinium. The game is intended to be played by 2 to 4 players and a game normally takes between 45 and 60 minutes to complete. Colony Structures - These cards represent your primary Colony structures that you have to build to win the game. The cards have two sides, a side that shows the built structures and a side that shows the unbuilt side. Structure Cards - The Structure Cards come in four different colors. This represents the various parts of the turn that the cards can be activated in. The cards have an Activation Target on the top right of the card, and these range from 2 to 15 but exclude 1, 9, and 16. To activate a structure and use the feature, you need to roll the same number on the dice during your Activation Roll as the Activation Target. 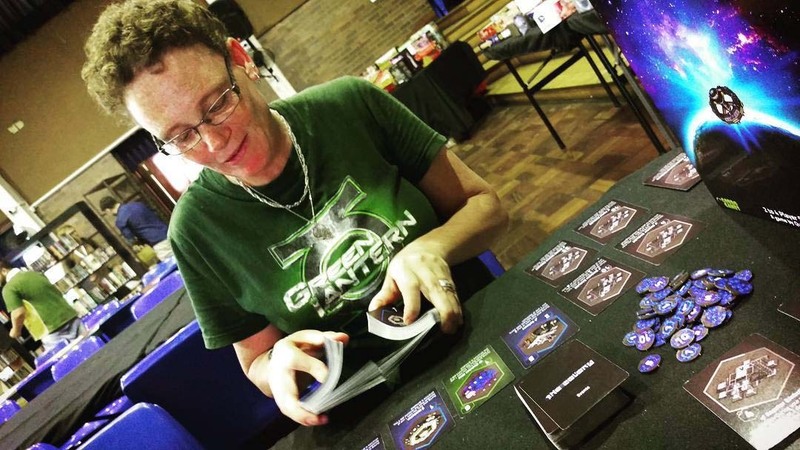 Event Cards - Event Cards represent random events that occur on the planet, these events will come in to play when you are unable to roll an Activation Target on your turn during your Activation Roll. Influence Cards - Influence Cards represent the ability of the players to influence dice rolls of anyone (including their own dice rolls). 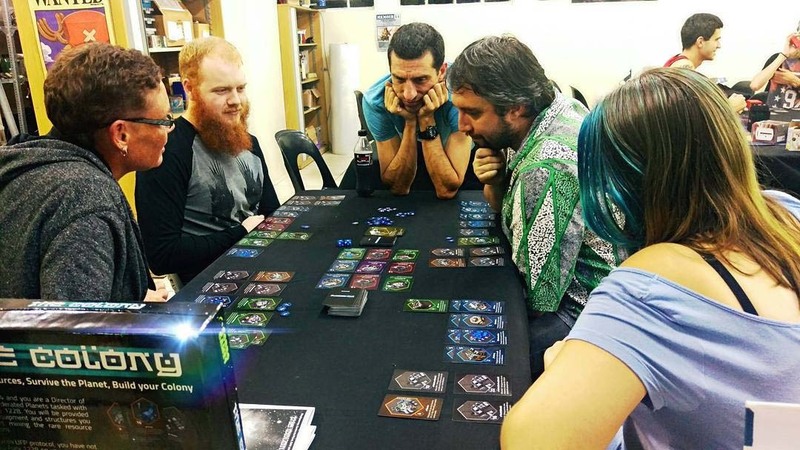 An Influence Card can be played anytime a player makes a dice roll by any other player (including themselves). Novinium Tokens - Players will typically have Novinium Tokens in front of them and this is referred to as the Novinium Stockpile. The rest of the Novinium is placed in a pile in easy reach of all the players and this is referred to as the Resource Pile. Target Tokens - Target tokens come in denominations of 1 to 16 units and represent the Activation Target that you want to target this structure on. These tokens can only be used on structures that are marked with a “Tt” on the Activation Target portion of the card. My baby brother is coming!!!! https://t.co/TtT9CsUm9A Riders of Asgard is being launched today!! "Played the game twice, each time the game was different and enjoyable. Easy to learn and game times vary, so replay value is great. The game dynamics are awesome and makes for a very strategic game, with some required luck thrown in for good measure." "Brilliant game! Not like anything I have played before. Easy to learn and the rules are very clear. Graphics are cool and crisp. It would be nice if I could win a game though." "This is so much fun to play! No two games are the same, and you have to be on your toes when playing and pray that luck is in your favour. Works well as a 2 player and a 4 player game, and is a great game. Love the artwork!" What is The Colony 2174? 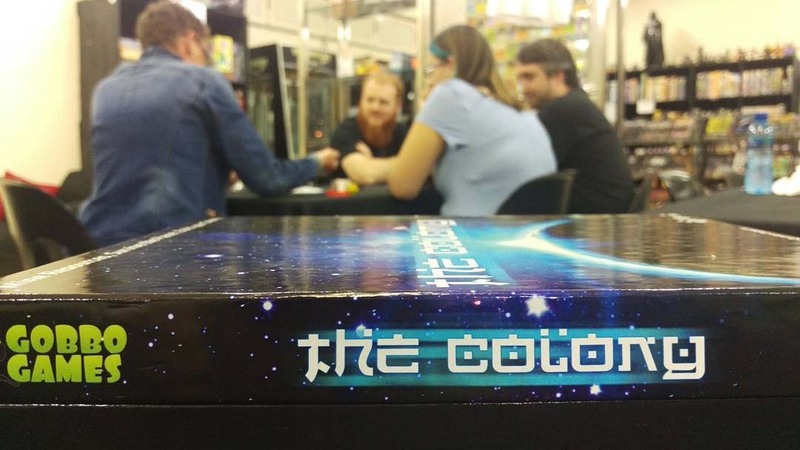 The Colony 2174 is a deck building and dice rolling game where you have to settle a new planet by building your four Colony structures using the rare resource Novinium. The game is intended to be played by 2 to 4 players and a game normally takes between 45 and 60 minutes to complete. 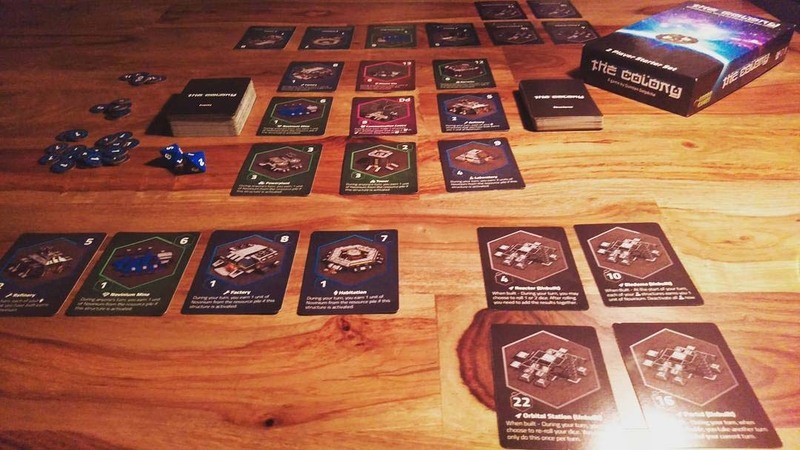 The game is won by the first player who builds their 4 Colony structures: Reactor, Biodome, Portal, and Orbital Station. You can lose the game by not building your Colony structures or ending up with no more structures of your own due to events that are triggered during the game. The Structure Cards come in four different colors. This represents the various parts of the turn that the cards can be activated in. Event Cards represent random events that occur on the planet, these events will come in to play when you are unable to roll an Activation Target on your turn during your Activation Roll. 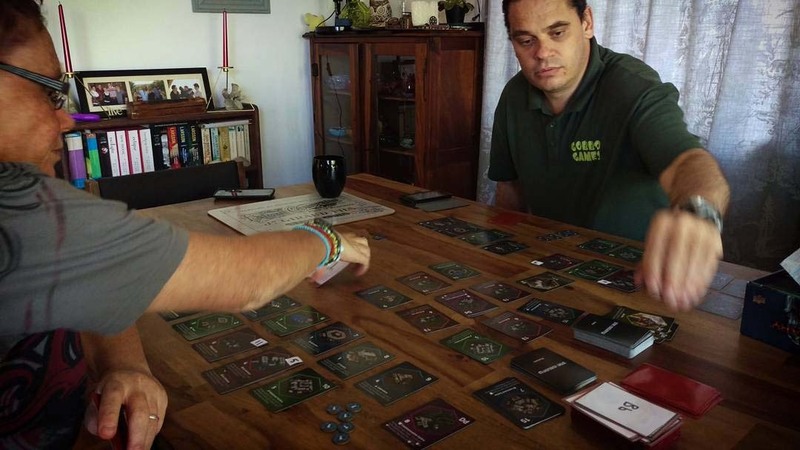 Influence Cards represent the ability of the players to influence dice rolls of anyone (including their own dice rolls). Players will typically have Novinium Tokens in front of them and this is referred to as the Novinium Stockpile. Target tokens come in denominations of 1 to 16 units and represent the Activation Target that you want to target this structure on. Currently we are using a Print on Demand (POD) service called The Game Crafter. The Game Crafter (TGC) is the world’s first web-to-print game publishing company and offers a print on demand game publishing service. 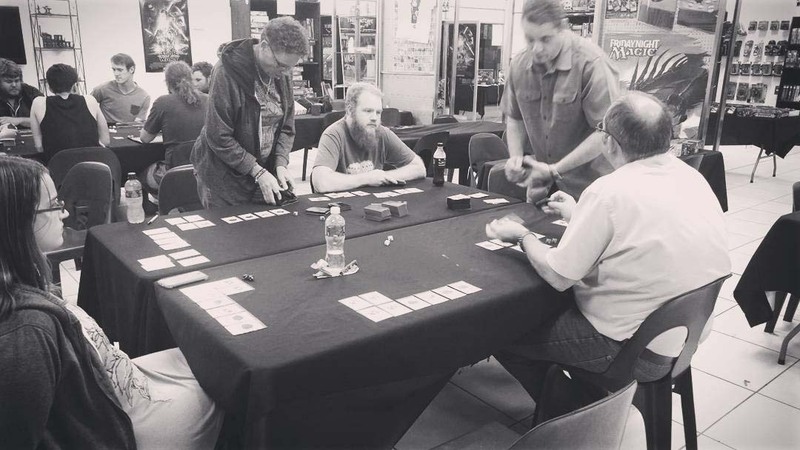 TGC empowers game designers around the world by allowing them to make a board game, card game, and custom playing cards through a website. 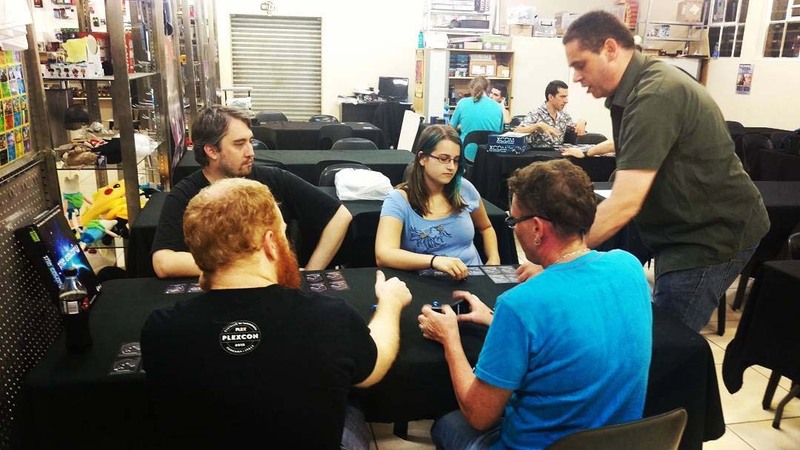 Using the latest web technology, TGC developed an online publishing platform that simplifies the design, manufacturing, and retail processes related to tabletop games.